Case study: Learn about DreamWorks Animation's partnership with HP Inc. IT security investments have traditionally emphasized technologies that reside on the network, but the print and document infrastructure is one of the most commonly overlooked elements for such initiatives. 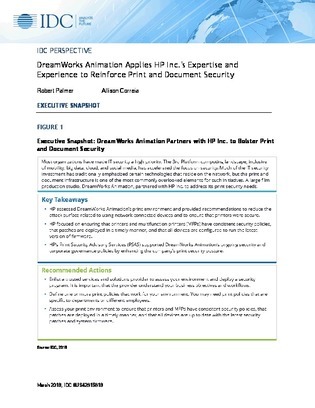 In this case study, learn how a large film production studio, DreamWorks Animation, partnered with HP Inc. to address its print security needs. The case study also provides recommendations for addressing your organization’s printer security needs.